An unclear pace scenario could work against a few of the top contenders. Hello Don Julio (#4), Snake Oil Charlie (#5), and Harpoon (#9) are all predicted to be contesting the pace, but none of them are exactly frontrunners. Roccia d’Oro (#1) and Birchwood Road (#3) come out of similar races, but have struggled with consistency. We slightly prefer Birchwood Road, who did well to rally through the stretch last time in a race that mostly held together on the front end, despite the apparent fast pace (color-coded in red). Roccia d’Oro was racing wide for much of that race, but was fairly dull in the stretch. Perhaps he’ll get sent out towards the lead today as the connections add blinkers and give a leg up to Jose Lezcano. One of the more intriguing entrants is Tiz Town (#2), who has a bit of tactical speed and ran well when stretched out to marathon distances in Kentucky. He was allowed to race up close to fairly moderate paces in those events, but we still believe that he’s an improved horse. Since we’re finding it difficult to foresee how the trips will play out, we will stick with the horse that we think is currently in the best form. MANITOULIN (#6) took a while to graduate out of maiden company, but he’s faced some deep fields of maidens in his turf races. In his turf debut at Keeneland, he was beaten by eventual Queen’s Plate winner Sir Dudley Diggs, and he ran well in two competitive maiden races at Belmont. He’s relished the stretch-out in distance and should have no issues negotiating today’s 10 furlongs. 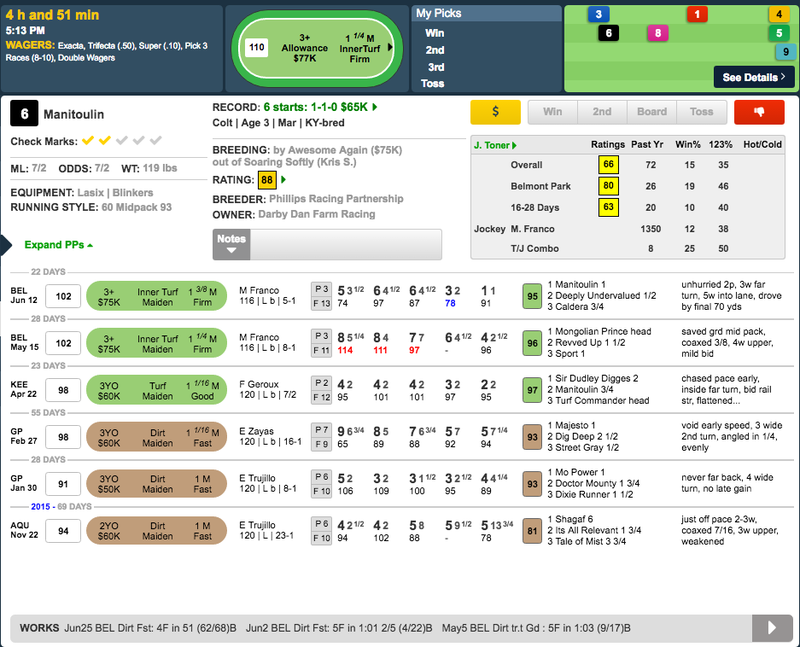 We acknowledge that his speed figures are on the slow side compared to a few others, but improving three-year-olds are often dangerous in races like this. We get the feeling that he’s just now figuring the game out and can continue his ascent in this mediocre N1X allowance race. Hey David, Again nice pick yesterday in the 8th. I would like to make a parlay with your selection in the 8th today. Do you like anything else ? You are the man !